At this point, no amount of scrutiny is too much when it comes to Angela Merkel. Here’s a little something to consider…. 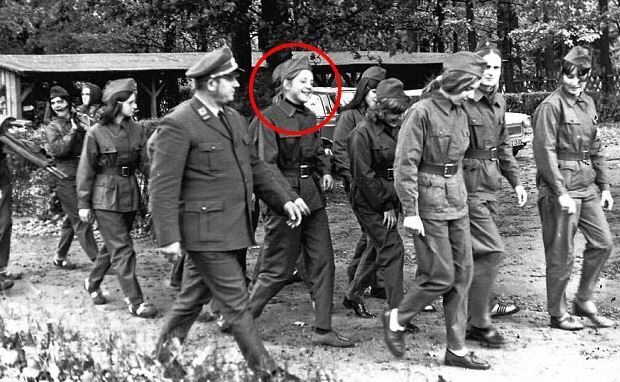 Stasi past: Merkel aka Erika? When you talk about the Stasi past German leaders, this concerns mostly members of the Left, former PDS, formerly SED. The conservative CDU had in this respect to be feared so far little. Especially not the German Chancellor Angela Merkel, which hardly anyone trusts in public, to have been active as a Stasi informer. What they also vehemently denies. Nevertheless, the Internet seething the rumor mill, in many blogs there are rumors of a dubious “Erika”, when Angela Merkel was allegedly called, revealing strange twists in the previous life of the Chancellor. But what’s behind it? Merkel herself denies the allegations always been very strong, she was a “IM – innoffizielle Associate” of the Ministry of State Security in the GDR was. To say in the ARD talk show “People at Meischberger” 2009 that they tried to recruit namely in 1978, when Merkel had applied for an assistantship as a physicist at the University of Ilmenau. After the obligatory interview she had been led into another room, where a Stasi officer tried to recruit them. You would have rejected this, as it could even keep a secret, so the Kanzerlin quipped at the time. However, some questions remain in space. Hanger for the distrust is the steep rise of the professional studied physicist who, strangely enough, began shortly after this ominous Stasi encounter. The place to which they had applied, did not get it, but went shortly thereafter with her then-husband Ulrich Merkel into East Berlin. There she found a job at the prestigious Central Institute for Physical Chemistry (ZIPC) of the Academy of Sciences, where she was in 1986 a doctorate. Merkel’s parental home was marked very Evangelical Christian and stood to the regime rather opposotionell. All the more surprising that she did not seem to bother this opposition. Anyway, she was a functionary of agitation and propaganda in the socialist youth organization Free German Youth (FDJ). She describes their activities retrospectively like as “cultural representatives” and stressed that it was finally been normal, to have been a member for many years in the FDJ. If you look at Merkel’s biography, it is noticeable that it was anything but a political opposition in the GDR. A concrete clue look at the Merkel-critics for their presumption that it does not take quite as accurate in describing the chancellor her past with the truth. It is about Robert Havemann, a famous regime-critic who had to live under house arrest in the GDR since 1976 and was under constant Stasi observation. The authors of a television documentary for WDR came in 2005 with the research for a film about the Stasi secret to the Act of Robert Havemann – and in there was a controversial detail: a photo of Angela Merkel. The picture was in a series of Stasi shots that showed people who were staying around the plot of Robert Havemann over the years or those visited. What did Angela Merkel there? Belonged to the officers conducting the observation? Visited the critic from a harmless reason? Not likely, because the access to the house only selected people were allowed. Visited it so official mission to spy on him? From Merkel herself there to little enlightening. They had been taken by a fellow student from the Havemann Family with the plot. That was all, no further comment. Spicy is in this context, but a fact that is occupied. During her time in the Academy of Sciences she shared an office with Havemann’s son, who also worked as a physicist. Pure chance? Angela Merkel claimed that they had practically to do with Havemann Junior hardly anything. ” The found from WDR Merkel image was not allowed to be sent in the TV, because Angela Merkel had prohibited the broadcasting of the photos in the WDR film. Wilhelm von Pax steht für kritischen und investigativen Journalismus. Wilhelm von Pax is critical and investigative journalism. Der Parteilose Publizist und Ökonom sieht seine journalistische Aufgabe in den Ressorts Politik, Medien und Wirtschaft. The independent journalist and economist sees his journalistic task in the departments politics, media and business. Politisch ist der Berliner Journalist liberal orientiert. Politically the Berlin journalist is liberal oriented. Tags: German Chancellor Angela Merkel, Germany, stasi. Bookmark the permalink.